Sometimes you need instant access to supplies, pick order inventory or assembly parts. You don’t want to open a box, carton or drawer – you just want what you need right there within reach. Traditional storage shelving requires adding bins, dividers and more to get that kind of access. There are some excellent alternatives! There’s a product called Rotabin that is a perfect solution for this situation. You’ve probably seen them in retail use at mom & pop style hardware stores where nails or screws can be bought singly. Rotabins come in a variety of sizes and numbers of bins per shelf. They make a great table top solution to finding the parts you need right when you need them. Just spin the rotabin to bring the right compartment into view and pick what you need. 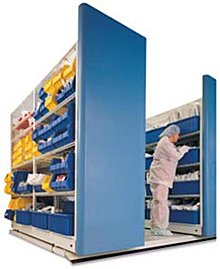 Mobile aisle shelving is a wonderful solution when floor space is at a premium and you have a lot to store, or to keep things tight and close as in a pick operation. Rather than having people running up and down shelving aisles, move the aisles to the people. Your shelving rides on a carriage system that runs on in-ground tracks in the floor. You spin the handle at the aisle end and move the shelving rows to give you access to the right location. Some systems are motorized to save on the manual labor and have safety sensors. The system basically works by compressing shelving rows through removing all aisle except one and that remaining aisle can open at any row of shelving you like. Some systems also allow multiple aisles. Our last high-density shelving option is actually a hybrid between shelving and pallet rack. The framework is pallet rack, but within the rack bays hand individual columns of ‘mini-shelves’. These columns are on tracks suspended from the pallet rack and are arranged so that the rack bay can be multiple rows deep as well as wide, and the ‘shelving’ is customized to the space you need for your inventory. This system makes pulling soft goods like clothing, shoes, packaged goods and more faster because you move within a highly dense storage system. It’s called SpeedCell and has solved many a pick manager’s woes by speeding up pick times and reducing worker fatigue by reducing the number of steps taken in a day. 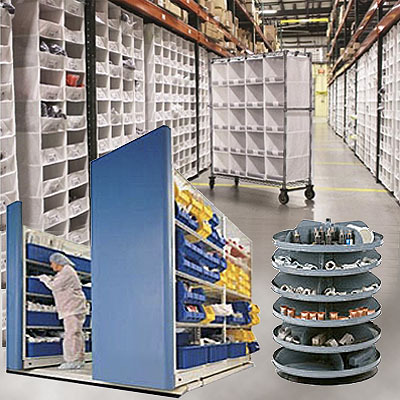 For many years manufacturers, warehousers and distribution centers have relied on the typical pallet rack and industrial shelving for storage, but those types of storage are intended for boxes and cartons, or pallets, not for quick pick, fast access situation. Take a look at what your worker access times are and consider offering some faster solutions to the mix. Remember, the increased productivity goes right to the bottom line.